Download a free aspergers checklist to help recognize asperger syndrome behavior or high functioning autism symptoms. Signs can often be hard to identify at an early age due to children usually having normal toddler speech development. However, it will be obvious from an early age that adequate social skills, pretend play and empathy for others is rare. In addition to viewing the checklist, be sure to also cross reference the list provided on the pages with more details about asperger symptoms and characteristics for autism to get the most detailed information possible. Note: You will need Adobe Reader to download the checklist. This is available below. 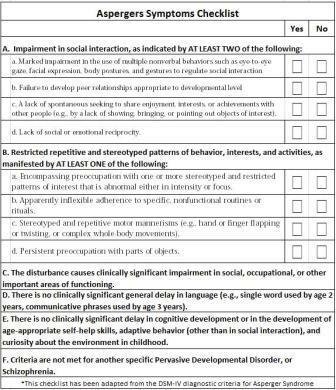 The following Aspergers checklist provides the symptoms as indicated by the DSM-IV diagnostic criteria(1). This is not intended to diagnose your child, but should be able to provide you with a good starting point for determining whether your child should have further evaluation. Talk with your child's pediatrician if you are concerned and consider contacting your local school district to see if they may provide free evaluations and services to help with problems you may be having. With an increasing number of children becoming diagnosed, most will offer services or be able to point you in the right direction. You will need Adobe Reader (the latest version is recommended) installed on your computer in order to open and print the aspergers checklist. You can get Adobe Reader here (a new window will open so you can download it without leaving this page, but you will need to temporarily disable any pop up blockers to open the new window and the checklist). If you want to open the file in your browser window, just click on the checklist for aspergers. However, if you want to download the file to view later, then right-click on the link and choose "Save Target As" or "Save File As." Then select where you want to save the file on your hard drive. If you suspect your child may have an autism spectrum disorder, be sure to also check out my pages about autism treatments.